Virtual Reality (VR) and Augmented Reality (AR) are revolutionising the health industry for both the patient and the professional. These technologies are already helping to enhance patient outcomes and improve medical education. The videos below show some applications of Virtual & Augmented Reality in healthcare. Chris O’Brien Lifehouse Cancer Centre uses Virtual Reality (VR) as a viable health care option for diagnosed oncology patients undergoing chemotherapy treatment. Read more. Alzheimer’s Research UK uses Virtual Reality to gain insight into life with dementia. Read more. Silver Chain Group has made it possible for a nurse to see their patients’ health data and consult with a holographic doctor enabled with augmented reality. Read more. 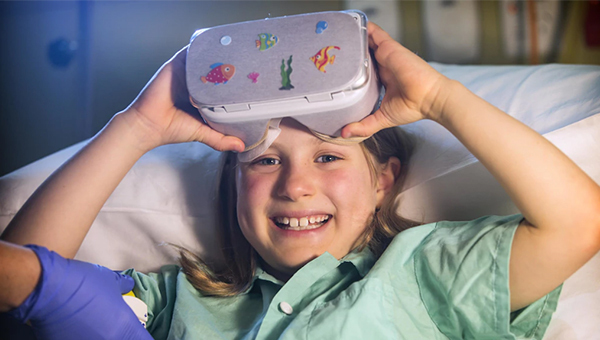 BlueCross introduces VR in aged care to enable the elderly experience what may have been outside their reach, such as travel, adventure, aquatics, even classical concerts and theatrical performances, from the comfort of their home. Read more. At St John’s, VR is helping children feel less anxious when they have blood tests and other painful procedures. Read more. Clinicians at Monash are conducting a research study using virtual reality to help distract patients from procedures in Pathology and Emergency Departments. Read more.